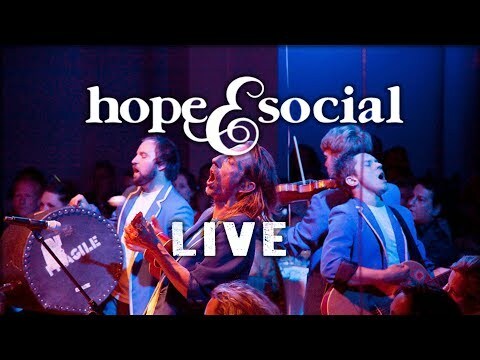 Hope and Social are a band… but not just any band. As well as all the normal things bands do (shows, festivals, tours, making records, videos & the like), they do the extraordinary, and put people at the heart of all they do. Hope and Social make events to remember – they really do. Who, what, where and how..? • worked with Arts Council England and the British Council in the UK, Georgia and Kazakhstan developing and performing “Bring The Happy” with interactive arts company Invisible Flock. • collaborated with “The Real Junk Food Project” to feed 400 and make the world’s largest Christmas dinner ever made from food destined for waste. And put on a darn spiffing show to boot! It’s all online (hopeandsocial.com/projects) and it was all only possible because fifty… five hundred… five thousand people came together to make good things happen. Extraordinary songs, virtuoso performances, beautiful moments & music hall bonhomie!